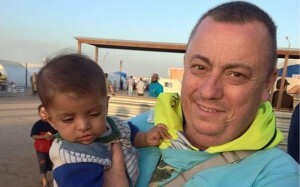 Further to reports of the murder of Alan Henning by ISIL, the congregation of Ashton Central Mosque are deeply saddened by this despicable and evil taking of the life of a man who went to Syria to help the victims of the conflict in that part of the world. Our thoughts and prayers are with Alan Henning’s wife, children, family and friends. For any group to perpetrate such an act of evil on the day of the Hajj and on the eve of Eid al Adha demonstrates their complete and utter disregard for Islamic values. These actions do NOT represent Islam and Muslims and their evil deeds only bring our faith and people into disrepute and we condemn them unreservedly. We the Muslim Community and congregation of Ashton Central Mosque, appeal to those who are holding this wonderful and compassionate man hostage to free him unharmed without delay. In doing this we believe our view is representative of the majority ( if not all) of UK Muslims. This man’s compassion for the innocent victims of Syria’s civil war led him to put his and his family’s lives and interests on hold in order to go and help those victims. In the name of humanity and in everything that is right and held in esteem by decent people of all faiths all over the world, we implore those holding him to release him so that he can return home safely to his family. This world desperately needs people like Alan who risk their own safety to help the needy. May Allah SWT guide those who are holding him captive and make them realise that there is no just cause for holding this innocent man hostage. It is contradictory to Islamic teaching and therefore the very cause of the people holding Alan hostage is likely to be diminished.